Kerala is an “all in one” package. It’s good as a honeymoon destination, perfect for a family trip, great escape for a solo traveler and also a hub for adventure lovers. And you can opt Kerala for a quick getaway too, from the bustling traffic. The best way to see Kerala is by road – passing through the green hills and forests and then, a relaxing day at the beach (Suggested route). Take a flight to Kochi, rent a car and then traverse the trails in God’s own country. And our first step would be at Munnar. 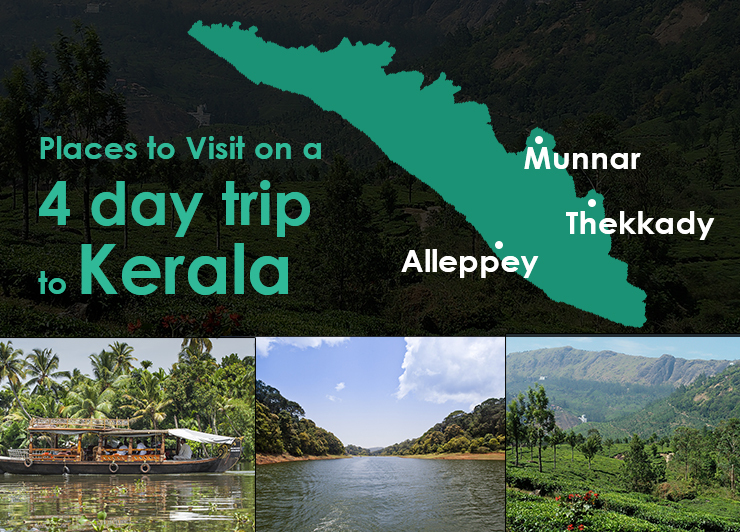 After getting off your flight, you will be hitting the road towards Munnar, about 140 kilometers (and 4.5 hours) away. You can also take a short road trip from the nearby cities like Bangalore, Chennai, or Coimbatore to reach Munnar directly. Online car rental services like Zoomcar operates in each of those cities. The journey itself is mesmerizing with tea plantations on the entire route. If you reach there by afternoon, relax, have your lunch and go towards Attukal Waterfalls for a pleasant evening, else check into the hotel and rest. You can find comfortable and good hotel rooms around ₹5,000 for two nights. Other places of interest in Munnar are Mattupetty Dam, Kundala Lake, Top Station, and Echo Point. There also is the Anamudi Peak, about an hour drive from Munnar, and you can see them all the next day. On your last day, go for Nayayamkadu Waterfalls which takes an hour worth of drive and at last, visit the Tea Museum. You will be free by the afternoon, and then you can go to Thekkady. A drive to Thekkady (100 kilometers away) takes 3-4 hours from Munnar. So, apart from gorging at the changing views from tea plantations to plains, there won’t be much left to do that day. So, reach Thekkady and check into your refuge for the night. You can book rooms in a resort at as low as ₹2,000. Thekkady is known for the Periyar Wildlife Sanctuary. This 350 sq. km area is the home to numerous flora and fauna. There are tigers, elephants, deer's and different birds and reptiles in sight. And apart from sightseeing, you can also go for boating in the lake (about ₹300 per person) or bamboo rafting. Then, there also is the night safari. Before moving towards Alleppey next day, pay a visit to the spice farm nearby. Alleppey is about 140 kilometers from Thekkady, and it takes about 4 hours to reach there. And while overnight houseboat stays may sound fascinating, opt for one of the beach resorts. You can find many starting at ₹3,000 for a night. Spend the evening at the beach. Not only the overnight stay at houseboats aren’t as comfortable as hotels, but these large boats also can’t go through the narrow canals. So, you won’t be able to experience much. Instead, book a backwater tour in a canoe. These small boats can accommodate 4-6 people and should cost you around ₹200 per person for a two-hour ride. In these two hours, you will be able to see the life by the waters up close, meet the locals, explore paddy fields, tiger prawn farms, and many other workshops. From Alleppey, you can then head back to Kochi, 50 kilometers away, to catch your evening flight to home. And your stay in Kerala and sightseeing will cost you only about ₹20,000 for two people. How? Let’s check the details. The hotel rooms for two people would cost you about ₹10,000 as explained above, and that would include the breakfast too. And the other daily food expenses probably won’t exceed ₹1,000 which makes it ₹4,000 for the entire stay. A rented car (from Zoomcar ) for the entire duration would cost you another ₹6,000 or more (excluding fuel cost). The boat ride at Thekkady and Alleppey would cost you an extra ₹1,000 and be prepared to pay ₹3,000-5,000 for the Thekkady jeep safari. If you factor in the price of two-way flight tickets from Bangalore/Chennai that would be another ₹5,000-6,000 for two people. So, for the 4 day Kerala trip, you would have to shell out about ₹35,000, and that doesn’t include any shopping. But you don’t have to worry. Monexo holiday loans have you covered. The process to get Monexo travel loans online is easy and quick, and with flexible EMI options, you can set your own payment schedule. Apply for Monexo personal loan today and get planning for your Kerala trip.